The saying goes that the happiest days of a boat owner are the day he buys it and the day he sells it. There may be some truth to that but we can say without a doubt that the process is very stressful for both buyer and seller. Although Bentekihutch was listed with a broker, he was in Bourgogne, a long way away. Haul out, survey and sea trial had to be done between the owners and us directly; to the credit of all involved it went well. By the second week of September we were living aboard the new OO-LA-LA. Paul and Jane were making plans to relocate to Spain. Everyone was happy. The new OO-LA-LA is a 40’ Dutch built steel motor cruiser with twin engines. Low, long and sleek, it can go under the lowest and oldest stone bridges in Europe with a beam wide enough to provide comfortable stability. There is a double cabin forward with in suite toilet; the master bedroom is aft with in suite shower and head. Two steering stations, one inside and the other on the outside allow for cruising in all weather. On the upper deck six people can sit for a meal or drinks. We rigged up the white pipe-framed awning with side windows over the deck (see photo) and enjoyed a ‘conservatory’ effect during some very breezy and cool days. It will be great on sunny winter days to sit outside and relax in comfort. Our second day aboard we enjoyed seeing old friends again; John and Caren came to see us for the weekend. We also got to know our neighbors in the marina of Port Ariane de Lattes. A true international community of Dutch, English, American, German, Danish and French people; everyone was outgoing and friendly. But it was not where we wanted to stay. Port Ariane is a small town and we decided to winter over in the city of Toulouse, on the Canal du Midi in Southwestern France. Before we left Port Ariane we had the pleasure of seeing Kathy and Ron Hooven from California. Kathy is involved in the International Police World Games to be held in Barcelona next year so was making a preparatory visit and decided to see us on the way. Finally it was time to go. Located in the center of Toulouse and highly recommended we made reservations at Port St. Saveur for the winter season. Compared to England or the USA, the cost of about 400 Euros (266 pounds or 400 dollars) for six months is miniscule. Most of the marinas in France are very reasonable and this is not unusually low. Early on a brilliant, sunny morning in late September we pushed off the mooring where the boat had lived for a year. When we looked back there were people up and waving hands from the marina. We waved back to the folks on Grand Cru, Amelisa, Abuela and Fromvuer and look forward to seeing them again in spring. Port Ariane de Lattes is on the edge of large lakes called etangs in French. The canal du Rhone a Sete goes through Port Ariane through the Etang de Thau arriving at the beginning of the Canal du Midi. 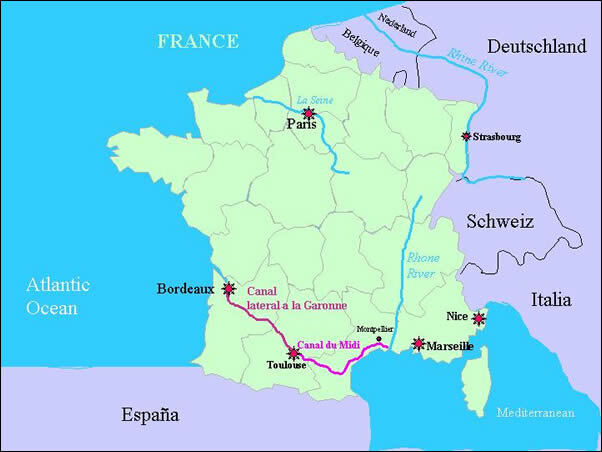 The Canal du Midi is also known as the Canal entre Deux Mers or the Canal between Two Seas since it goes from the Mediterranean to the Atlantic. The trip from Port Ariane to the mouth of the Midi takes about a day with dramatic shifts in environment. Oyster beds are cultivated in the etangs; flamingoes also flock there by the thousands. On the etang the water is wide and the feeling is Mediterranean; the sky is big and bright. Small Provencal towns dot the coastline. Sailboats are more plentiful than motorcruisers. After about an hour a red and white lighthouse marks the opening of the Canal du Midi. As we scoot in the feeling is seacoast; along the canal are colorful sailboats. The water is still salty. Within six kilometers we arrive at the first lock just before it is about to close at 6 PM. In France most of the locks are manned by eclusiers (lockkeepers) and they keep strict hours, generally between 8:30 AM to 6PM with an hour break for lunch. As we exit the lock the canal amazingly transforms; we are in a gorgeous canopy of elm trees perfectly lined along the banks. It is impossible to describe the beauty, so photos will have to replace a thousand words. We moor outside the lock at Agde, the first town on the Midi. At 8:45 AM the next morning we are having coffee and spot the lockkeeper eyeing us from the lock gate. There is another boat coming out and she is letting us know that it would be a good time for us to come in as they exit. This is a large round lock that also opens out onto the Herault River. As we lock through we chat with the eclusier. We were told we could buy our cruising license from the lockkeeper so we make inquiries. “Sorry” she says, “the VNF (Voies Navigables Fluvial or the equivalent of the British Waterways in the UK) guy is out today so you’ll have to get it at another place.” She is friendly and gives us the application for the license but says that there is no problem; if anyone asks just tell him or her that he wasn’t in at the time. Licensing in France is about 130 Euros for a boat of our size and works on a system of trust. A 30-day license is good for a year; one just initials the day of a cruise on the boat until all 30 days are used up and then applies for another one. Mysteriously it seems very few boats cruise more than 30 days a year. This seems okay with the VNF; their application even says that only the ‘true fanatic’ would apply for anything longer than 30 days. No one checks the license either. Although it is supposed to be displayed on the windscreen, we are never asked about our (absent) license. In deference to this delightful system of trust we feel honor bound to get one if only to encourage the freedom to cruise without Big Brother. Trust is the best system of all. We moor just outside the lock at Agde to go in search of diesel. So far we have seen no pumps on the canal and inquiries in Agde bring us to a gas station in the middle of town, too far for any pump handle to reach our boat. Out come the red jerricans and wheelcarts as we trundle back and forth to the boat to get us enough fuel to make another one or two days travel. The price of diesel is France is high: 83 e-cents a litre at the pump in town compared to 39 cents a litre in England (26 pence). And we didn’t have to lug it. We plan to take revenge out on the incredibly good and inexpensive wine and food. After a morning of moving fuel to the boat we enjoy lunch on deck since the weather is delightful. Late in the afternoon we putt down the canal to the small town of Villenueve de Beziers and tie up to a couple trees. The trees along the canal are more than decorative. They make excellent bollards to tie up to, which many people do; also their roots keep the bank from eroding and make for good dock rings. In Villenueve we decided to get a bit more fuel and made inquiries at the local bar. There everyone participates in directing us to the nearest gas station when a friendly young man offers to drive us there himself. He first drives to his office in Beziers to get another jerrican to add to the load. Within 20 minutes he accomplished what would have taken us about two hours to do and we are most grateful to Dennis, our hero. We also meet our neighbors on Arabica, Alan and Shirley from Richmond-on-Thames in England. They have a lovely boat and have also cruised in their sailboat in the USA on the Intercoastal and the Erie Canal. It was great fun to enjoy some rose wine with them and swap books and boat stories. The next morning we wave goodbye as we head down the Midi towards Beziers. It is the first day in October, the air is fresh, the baguettes are crisp, the grape harvest is almost complete and we are now Living the Dream in France!